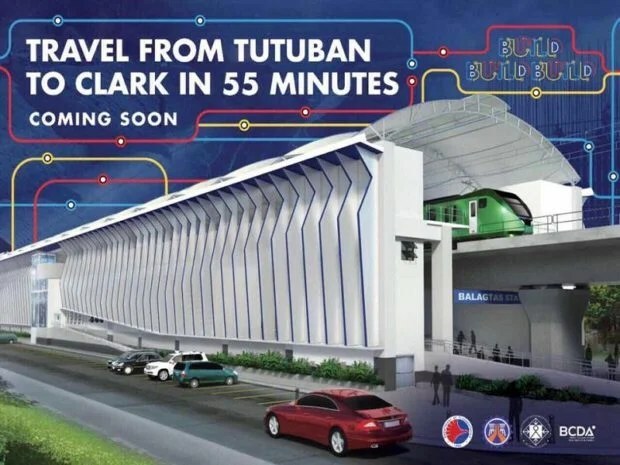 MANILA — The Department of Transportation (DOTr) leads on Monday (June 26) the marking of five future stations of the Manila-Clark Railway Project, the line that will connect Manila to Central Luzon. Transportation Secretary Arthur Tugade will lead other government officials in the marking ceremony for the five of the 17 stations: Marilao and Meycauayan in Bulacan, and Valenzuela, Caloocan, and Tutuban in Metro Manila. The 106-kilometer railway project, running from Tutuban in Manila to the Clark freeport zone in Pampanga is among the “high-impact” projects of President Duterte under the government’s “Build Build Build” infrastructure program, according to the DOTr. “This big project, it used to be just all talk. But under the Duterte administration, we will make it into a reality. For the first time, a rail project will connect Manila to Central Luzon and it will be completed under the Duterte administration,” the DoTR press release quoted Tugade as saying. The department said the rail project, once completed, would cut down the two-hour travel time from Manila to Clark to just 55 minutes. The rail system will also benefit 350,000 passengers daily on its first year of operations. Apart from the marked stations, the 12 other stations are: Solis, Bocaue, Balagtas, Guiguinto, Malolos, Calumpit, Apalit, San Fernando, Angeles, Clark, Clark International Airport, and the proposed New Clark City in Pampanga. The DOTr has said construction of the new project will start in the last quarter of 2017 and is expected to be completed by the last quarter of 2021. The project costs P255 billion and will be funded through the Official Development Assistance (ODA) from Japan. The whole line will have 13 train sets with eight cars or coaches per train set. Each train can reach a maximum speed of 120 km per hour. Philippine National Railways general manager Junn Magno said the project would to decongest Metro Manila and spread economic gains throughout the country. “This project will ease traffic congestion and help thousands of commuters coming from Bulacan and Pampanga who travel daily to their workplaces or schools in Metro Manila,” Magno added. Contact us for latest inventory, sample computation and FREE Tripping! Ask Us. FREE TRIPPING! Contact us directly!